Student Anne, said that she thought that Tetsuo Fujimoto wanted the image to flute…. "Tetsuo Fujimoto, who trained and worked initially as a weaver, describes his work as ‘machine drawings’ which are created by densely layering stitch mark on top of stitch mark, covering the base cloth and building up an extraordinary surface which ultimately becomes three dimensional. It is important that the work does not lie flat against the wall; the shadow created by the fold is of paramount importance. Fujimoto talks about his work as encompassing the macro and the micro. 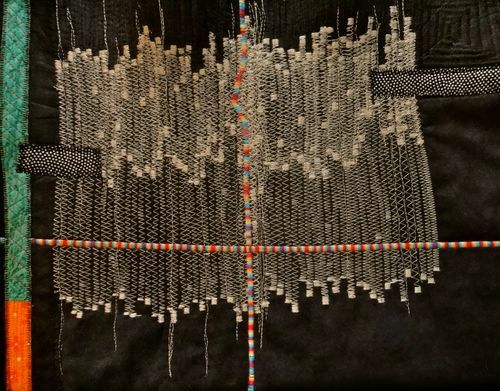 From a distance the work appears as a dynamic surface, from two metres we experience it as an engulfing space and from 15cm we see the intense layering of thread and stitch." So I've played… I let it flow and wander and I don't think I will do another one… but I wanted to "experience" the technique.